Welcome to our Featured Founder series, where you’ll meet startup founders from Tampa-St. Petersburg who are building and scaling their ventures to solve some of the world’s greatest challenges. 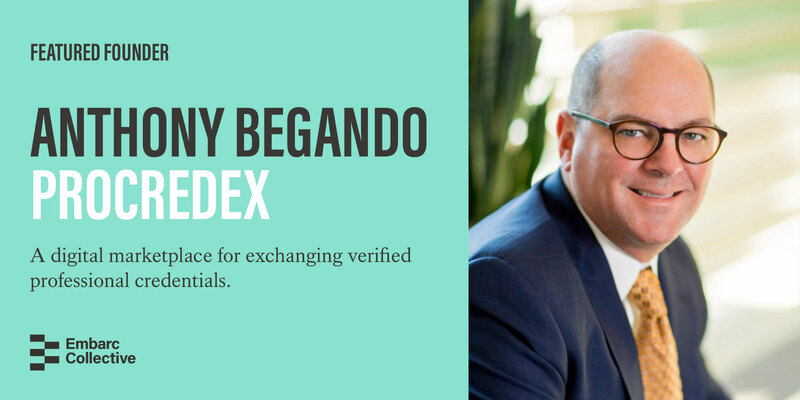 We interviewed Anthony Begando, Founder & CEO of ProCredEx, a digital marketplace for exchanging verified professional credentials. I have been a serial entrepreneur for almost 30 years. I have largely focused on building B2B technology companies, tech-enabled healthcare services firms, and consulting operations focused on corporate/operational development. While in my last year of college in 1991, I was recruited into an IV Pharmacy Outsourcing start-up called Central Admixture Pharmacy Services (CAPS) to be a “technology guy” and project manager. The venture was conceived by Jim Sweeney who had recently purchased McGaw (third-largest IV solution manufacturer behind Baxter and Abbott Labs) and was looking for innovative ways to expand the company’s flat revenue growth. McGaw and DLJ invested $20MM to build out CAPS and bring to market a transformational model to create a just-in-time IV admixture outsourcing business targeting the nation’s largest healthcare systems. What began as an interesting business concept drawn out on a conference room whiteboard rapidly became a 24/7 high-speed operational deployment initiative. We opened our first facility at City of Hope in Los Angeles and, within a few months, began the process of opening production facilities in 13 markets across the US. We went from $0 to $23MM in annual run rate revenue in about 18 months. Initially, my role was to work with our sales team in onboarding new clients and either integrating their in-house pharmacy systems with our production systems or setting up and training clients on our PC-based order entry system. I developed a national professional services team to scale with the rapid growth of the firm and ensure that all new clients were onboard successfully. After two years of that work, I was appointed Director of IT and took over our poorly performing in-house development team. While, operationally, we were doing exceptionally well, the tech running the back-end of the business was awful. Having recently graduated, I applied many of the software engineering principles I had learned while in school to completely re-engineer our software development processes and systems– transitioning our team into a highly productive, service-focused organization. We took McGaw/CAPS public in 1994 at $18/share and sold the firm shortly thereafter at $36/share. CAPS was closing in on $40MM in sales in our third year and contributed heavily to McGaw’s valuation. This was an indelible experience which has greatly influenced my career to this day. In April 2002, I founded Tenon Consulting Solutions, Inc. (Tenon) as a firm focused on operational formation/reengineering and development. By July of that year, we were profitable and growing rapidly– having closed about $2MM in initial project work. One of our early clients was the US Army Reserve who had hired us to develop a global center for centralizing the administrative management for over 11,500 medical officers. In performing this work, we had to address the significant problems associated with “credentialing” these individuals for their intended duty assignments. “Credentialing” involves verifyingvirtually every aspect of an individual’s professional background, education/training, employment, licenses, certifications, insurance coverages, malpractice claims, adverse events, and so on. Historically, every Army Reserve medical/dental unit had done this work for their soldiers locally and struggled mightily to perform it well. As such, Army Reserve clinicians would be mobilized or deployed and inevitably run into significant problems upon arriving at their duty stations as their credentials were not complete or compliant– requiring that work to be done prior to their being allowed to practice and deliver care. In many cases, practitioners would wait for weeks for this work to be finished prior to their assignment “clock” began– causing significant resentment and creating a material effect on long-term retention. We developed a highly efficient, automated operation within the Army Reserve Headquarters at Ft. McPherson (Atlanta) and took mobilization readiness for their advanced practice practitioners from less than 8% to about 94% in a little over three years. In 2006, we were awarded a contract by the Army National Guard (ARNG) to develop a similar operation for their clinical officers in serving all 54 states and territories. Rather than have that operation located with the ARNG Headquarters in Arlington, VA, we were asked to build a wholly outsourced operation in Atlanta. Building on our experiences (and lessons learned) from the prior work we had performed for the Army Reserve, we capitalized and developed from the ground up an operation that was exceptionally successful as evidenced by reducing costs by 35% and improving readiness to 99.4% force-wide. Following our national deployment we were awarded the Surgeon General’s Excalibur Award as having the most effective program for improving clinical readiness within reserve component forces. In 2013, we were #15 in Atlanta’s “Best Companies” to work for competition. In all of our work, however, we were unable to reduce average cycle times for individual credentialing episodes down below 18 days. Even with excellent workflow and CRM capabilities, we simply could not control response times for verification requests from organizations that would provide that information slowly. A few years ago, we began to research different methods and approaches to address this problem. The fact that every organization that either delivers or pays for healthcare services was independently and redundantly redoing this work brought to light that no single party controlled access to this data– rather it was everywhere. If we could establish a means to systematize, monetize, analyze, and distribute this data in a secure and reliable fashion, we could create a disruptive utility that would significantly reduce the time, costs, and effort historically associated with this process. Further, by giving individuals a simple, secure means to control and distribute their information across the 15-30 organizations physicians and advanced practice providers must concurrently maintain this data with, we could gain their buy-in and acceptance. We began building the technology that would help us realize this vision. In late 2017, I was introduced to the founders of Hashed Health in Nashville by the Chief Medical Officer at Intel Corp. Hashed Health had been working on several initiatives related to provider identity where the use of distributed ledger technology could provide an indisputable layer of “trust” between counterparties looking to exchange that information. In short, after a few months of collaboration, we agreed to form a joint venture to combine our efforts and develop what is now known as the Professional Credentials Exchange (ProCredEx). We launched the company a year ago and have worked very hard to establish a consortium of major healthcare organizations, insurers, technology firms, and implementation partners to bring this solution to market. We are creating a simple, reliable, and secure means to share and distribute verified professional credentials and really redefine the way we think about professional identity generally. The “credentialing problem” is so pervasive across the US healthcare industry alone that, if we are successful, we will create a solution that benefits nearly everyone involved in the delivery or reimbursement of care. Beyond that, our solution will have similar applicability to virtually any regulated industry where credentials verification and sustainment are a condition of employment or engagement. This includes industries like aviation, financial services, public safety, energy, construction, accountancy, and so forth. Further our solution is applicable to these industries globally– as evidenced by the significant international interest we have had in our work. Scale is critical to the development of this business model. Simply said, you cannot have a marketplace without the requisite supply needed to fulfill demand. I equate it to opening a new grocery store: When folks come in, they expect fully stocked shelves. If you cannot meet their inventory expectations, they’ll leave and probably never come back. That said, upon founding the business, I have spent over 60% of my time building a consortium of “Design Partners” that are supporting our development efforts and will bring tremendous data supply to the market. Further, in building an industrial-level solution such as ProCredEx, you must build a partner network that can both drive channel sales and provide significant implementation support. In both cases, we have been very successful and are continuing to grow our Design Partner base each month. We have done a detailed technical analysis with a number of blockchain and distributed ledger protocols to determine those which will give us the levels of performance we need within the exchange. Frankly speaking, many of the early blockchain and cryptocurrency-oriented technologies struggle to perform efficiently at even marginal scale. We need to know that we can operate at tens of thousands of transactions per second and only a handful of technologies have been proven to operate at that level. We are very close to choosing our go to market partner(s) in this regard and, following integration into our platform, plan on implementing regional pilots within our partner network. We are also actively involved in closing a $3MM seed round intended on funding that work and preparing the firm for our commercial launch. Give us a tactical piece of advice that you’d share with another founder just starting out. Don’t believe your own hype. If you’ve got a great idea, prove to yourself (and others) that you can develop a business model that creates a capital efficient, profitable operation using realistic resources, sales, and operating expense assumptions. I have personally done this by building out very detailed, variable driven business model simulations in spreadsheets that help me truly visualize the business, marginal performance, and growth model. It may take you weeks to design, build, and refine this but it’s critical to having a realistic and achievable business plan. Take this model and review it with several CFO-types in the industry you are targeting and have them beat it up. Review all of your major assumptions/variables and ask them flat-out “would you (or your customers/partners) buy this?” If you don’t get a definitive “yes!”, go back to the drawing board. Learn more about Ex3 Labs on Twitter, Instagram, and LinkedIn.